NBA2K has been the premiere basketball game for over 5 years, and one of the most successful and well received sports franchises ever. As Frontend Art Lead, I had to make sure that we put together an amazing UI package for the most ambitious NBA 2K yet. This year, we were looking to overhaul our MyCareer mode. With the inclusion of a cinematic story mode put together by Spike Lee, MyCareer was shaping up to be huge, so the UI needed to match. Our general look for this year was pushed forth by our art director Herman, who drew from the LED pattern we had established for the rest of the front end, adding bold blocks of text and color to punch up what we would call our “super” menus — high profile screens that would get a lot of traffic and needed a lot of love. I got to work, fleshing these ideas out to build some of the core pieces that would make up the most popular mode in our game, MyCareer. The gateway menu to the mode, the Next menu allows players to manage their MyCareer experience. I was tasked with putting together a look that would drive the rest of the menus for MyCareer, as they all live in the same world and work with each other. I worked closely with game designers and, after much iteration, we came up with an in-game menu that not only sets the tone for the UI, but is — most importantly — fun for users. 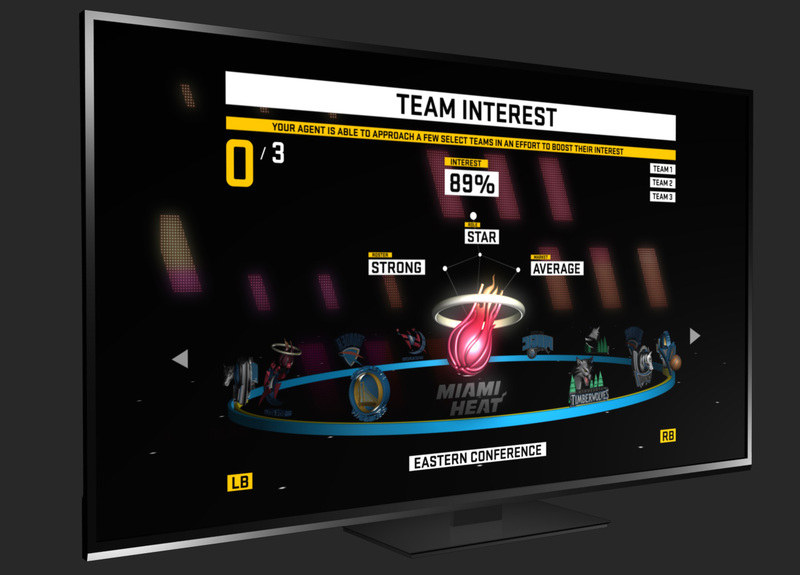 The connections menu allows players to foster in-game relationships with real players and celebrities, emulating how a real basketball player would deal with their social network on a day-to-day basis. Working closely with one of our awesome concept artists, Zhen, and fleshing things out with game designers, we came up with a look that was clean and easy to navigate, giving users the immediate information they needed as they moved in and out of the screen. 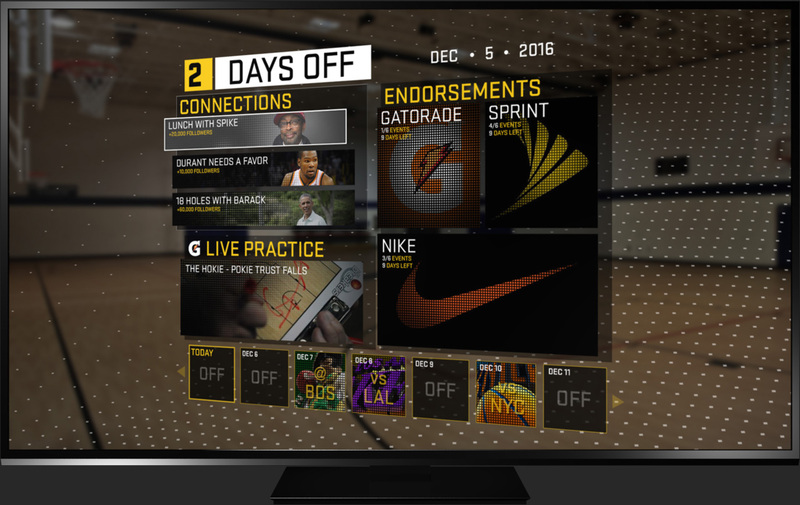 Another key screen in MyCareer is the Endorsements Menu — the area where players manage their brand connections and obligations. As this is handled through your virtual agent, and in a timeline, it needed to feel more like an inbox with a calendar. I worked with our Art Director, Herman, who found a look that fit with our established style for the Next Menu, but remained visiaully consistent with the language of an inbox. I then built that look out, refining it to best fit our evolving MyCareer style. A major showcase piece of the revamped MyCareer mode for NBA 2K16 is the Free Agency menu. Unlike most other Frontend screens, this screen, while requiring user interaction, also required a very specific flow and interactive sequence for users — guiding them through a highly presentational experience . To achieve this, I took input from producers and developed a flow that would be visually interesting for users as they made major game decisions in the off-season. I then worked with artists on my team to see this through as it further developed in-game.